The German "Krautkrämer reflectoscope" testing flaws in metal tubings in the 1950s. In 1946, Norman Branson and Peter Bloch formed the Branson Instruments Company and began manufacturing an ultrasonic thickness-gauging instrument known as the Audigage. 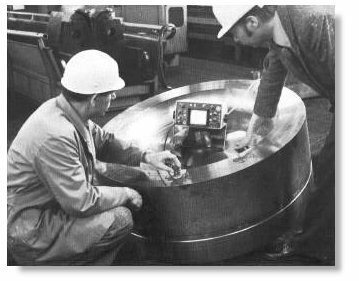 These early units used ultrasonic resonance techniques to measure work piece thickness from one side. They were built in the company’s first location, a two-car garage in Danbury, Connecticut. Along with their NDT product line, Branson Instruments developed products for medical applications. Branson’s efforts were joined with those of Smith Kline & French Laboratories, one of the largest U.S. manufacturers of pharmaceutical products at that time. In 1964, Smith Kline & French took over Branson Instruments. In 1970, Branson Instruments acquired Aerotech Laboratories. Aerotech Laboratories had begun in the basement of a Strodes Mills, PA home in 1969, and moved to the Mifflin County Industrial Park in Lewistown about a year later. Their product line included transducers for industrial and medical applications. Aerotech’s highly damped ultrasonic probes with improved resolution promised to strengthen Branson’s product line. In 1949, Dr. Josef and Herbert Krautkrämer developed the first German ultrasonic flaw detector. Their instrument operated according to the pulse-echo method, which not only detected flaws existing inside the material being tested, but also determined their position. This first Krautkrämer flaw detector was suitable for testing forgings, axles and plates. Krautkrämer established offices in Belgium and France as early as 1951. More offices in countries around the globe were added in the following years. By 1953, Krautkrämer had developed devices for weld testing and quantitative flaw location, as well as the first testing machines for rails, tubes, and plates. 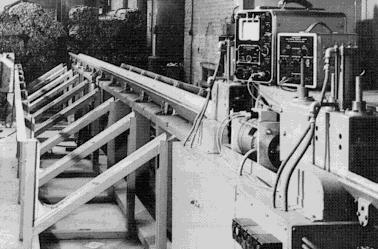 In 1960, the first tube-testing machine equipped with rotating probes went into service. Two years later, the first, and for many years the smallest and lightest all-transistorized, battery-operated instrument, the USK4, was developed. The USE1, designed primarily for automatic testing systems, consisted of 20 interchangeable modules, and was launched in 1969. In 1972, Branson Instruments merged with Krautkrämer GmbH of Köln, West Germany, now operating in Hürth on the outskirts of Köln, establishing Krautkramer Branson as the world’s largest manufacturer of ultrasonic testing equipment. Research and development projects were coordinated, and technical consulting and sales networks operating worldwide were brought under centralized management control. In 1984, the St. Louis based Emerson Electric Company purchased Krautkramer Branson as a wholly owned subsidiary. As part of Emerson, Krautkramer, (the trade name we market to the world), continued to grow in terms of products and technology for worldwide industrial and medical markets. In 1991 Krautkramer purchased 50% of Hocking NDT allowing it to enter the Eddy Current market. In June 2000, the Agfa-Gevaert Group (AGFA), Mortsel, Belgium acquired the entire worldwide Krautkramer business from Emerson Electric Co. Agfa Non-Destructive Testing Business Group's emphasis on non-destructive testing provides growth opportunities for Krautkramer because of the strategic importance of NDT in Agfa's business portfolio. Image courtesy of NDT Internet Publishing, Herford, Germany. Text courtesy of Krautkrämer GmbH.